The expectation of meeting Bear Grylls was always, imagine if I actually could. But it was introduced to me by a man who I pestered for ages to speak about my expedition to the Darién gap, with with the hope of reaching bigger audiences. My first meeting with Andy came the way of a coffee shop in my city centre Birmingham. We spoke for nearly an hour but prior to this we were back and forwards on emails and text messaging. On the frst meeting I made my trip sound the best I could, in my eyes it was the ultimate adventure and to share that with other people is quite hard, it is like selling a product to someone who doesnt really have use for it. It seemed to of worked as we sat for a good length of time just discussing reasons why, where and how. Each one of these question easy for me I would say. We spoke of the dangers the aims of the project and how I would love to get the exposure of a huge audience. He had the means. As the conversation got further in and question where asked and answered, bear grylls was mentioned as he was planning a trip to Birmingham for a grand opening of a new adventure park he was in charge of the opening of the park was huge, first of a kind for Bear Grylls I was asked if it could be on the cards to meet him have a quick chat and a photo op would I agree, I bit his hand of literally. I have watched bear countless times on TV applied for his series the island I got through to stage 2 unfortunately no luck. Maybe having now met him I could be in for a better chance, who knows. A date was mentioned for October which was 2 months away at that time I said yes I would happily book work of if there is a chance of that. Nothing more was said just what I had planned for my trip to Colombia and what is expected to happen in the near future. We finished our drinks and turkish sweets, Andy left first I bought another drink and rang a family member to tell him of the discussion. I headed back to work thought nothing more of the conversation but hoped it will come good. The week continued as normal early shifts and late finishes. The weekend came around I was at work as normal day to day duties. As I got back home to a number of emails I was given the date early september the next saturday so 5 day away. 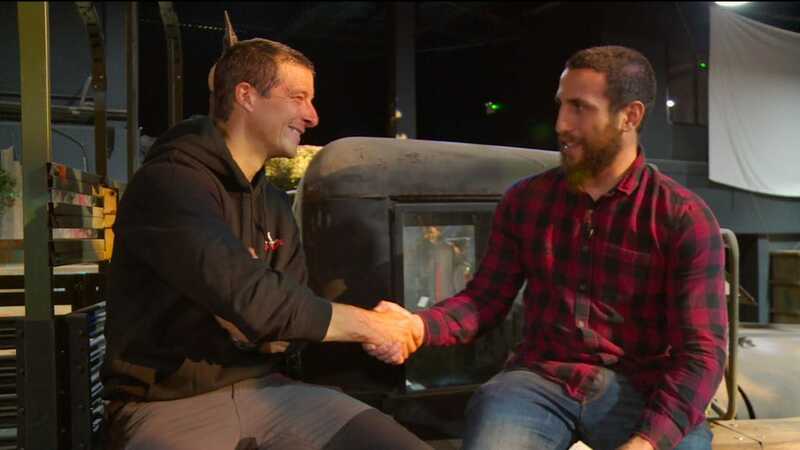 The opening date had moved forward for Bear Grylls adventure centre. I was asked how do I feel about meeting him sooner I laughed and snapped up the offer. I was asked to bring paperwork relavant to my exped to the meeting it was a saturday. The planned day again at work I spoke to who I needed to and I had gotten the time off in the day to go for the meeting and grand opening, of bear gryllsadventures park. As we arrived we got a good parking space i was worrying for some reason I saw him being interviewed taking snapshots with people. Myself and Andy was shown around the theme park to the dive area with actual black tip reef sharks in, to the mystery tunnel and climbing wall. We took some images of the events which were being offered. The place was bustling with reporters from up and down the country, each time someone was interviewing there would be a loud shhhhhh! we are filming so it went quiet really quiet! This happened a number of times, until our time which I have no idea how it was pulled of to be last Andy interviewed him initially about the grand opening and then after the main interview. Bear initiated a conversation saying there is someone I am talking to isnt there Andy said yes this young man here. "but can we go somewhere relavant he aint diving". Bear laughed and said yes. There was a lady who I presumed was his timekeeper for the hectic schedule he had that day. She stated it is only one question so be quick I froze thinking ok.. Bear then stated NO! its a conversation. They must of thought I was a member of the news team or just a general fan which of course I was that aswell, a bit more than a general fan I would say. So bear then asked us to follow him we sat by an old land rover model which is the epitomy of an exped of this kind especially when it was land rover who funded the first land crossing of the gap through the centre of the range which was a ridiculously gruelling trip. And a huge team the more elements of a team the more chances of issues arisingand a number of them arose. So we got talking I asked him had he heard of the Darièn gap in the past he said yes I have I have actually been, I was a nervous wreck he was smaller than id imagined but nontheless, a trip to the gap If he aint with you the next best thing is to get advice from him surely. So I did he spoke to me about the issues I would face from Narco traffickers, people smugglers and arms smugglers all of which are a huge issue on a lone exped. To then add the venemous snakes to the posionous frogs all help in the failure of a trip of this kind. So back to the advice he gave I quote him here "It will be like putting your head into a hornets nest." Which wouldnt be a pleasent or rewarding expereince at all, he then went on to tell me notorious for kidnappings but we wont go in to that. So his opinion on the exped was a good one overall he was impressed I would like to say of me attempting a trip like this. Water advice foot health advice which is the two quickest ways of deteriating a person body in an envoirement. like that from not being able to move one extreme to the other rapid dehydration. A serious problem for anyone no matter the collabor of person, mindframe, physical abilities or experience. Emergency plans he asked about and say to have one in place. With all this said and a 10 minute interview has came to an end I would like to thank him for his time. My trailer and interview for my upcoming expedition.